We have departed on our trek from Germany to Italy. At first this seemed insurmountable to me. I am after all a Canadian used to traveling great lengths to get from one place to another. When I first gazed upon a map of Europe when I was planning this trip I was stumped by this leg of the tour – traveling straight across one country in a day seemed outrageous! Then a man at Wanderlust reminded me that one can drive through Switzerland in two hours time. So I reconsidered and planned an ambitious journey. So we are traveling from Rothernburg through to Lake Como. I think two hours was very much an underestimation as it turns out. Unless he was traveling in a very different direction. As you know from my last post, we departed Rothenburg en route to see the castles outside of Fuessen, at the very bottom of Germany. Thankfully it was pouring with rain, so we ultimately ended up gazing up at them through the fog from the base of the town and elected to not walk the road up the mountain in the rain. Had we opted to do this, we would never have made our destination. We crossed the border and ended up in Austria, where we needed to purchase a ticket to drive the five minutes until we were in Swittzerland. Then we were in Leichtenstein and then back in Switzerland and then drove through gorgeous mountains until we reached Lugano at the south end of Switzerland. 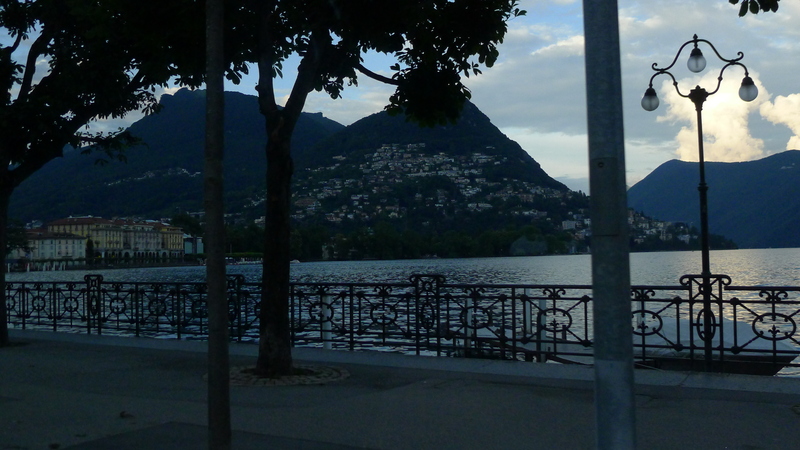 From here we crossed without fanfare into Italy – in fact I don’t even recall a border – and made our way along to Lake Como and our final destination for the day. It was 10pm. So much for the 2 hour drive through Switzerland! We in effect drove through 5 countries in one day!